We look at Restorative poses with a concentration on the Element and Season of Earth moving to Metal. The seasonal change from Earth to Metal is one of transformation and moving from fullest Yang softening into cool, dark Yin energy. Earth is Yin, feminine, the personification of Mother Earth and representing the center. Earth’s symbol is the black and white yin/yang. Although Earth is a yin element, it can exist in a Yang or Yin state. Earth expresses its color as yellow and its traits are the ability to be stable, practical, reliable, industrious, empathetic, honest, kind and prudent. Earth values friendship, and needs to meditate and nourish itself physically, emotionally, and spiritually. We begin to explore the Spleen and Stomach Meridians, and work with the belly center. 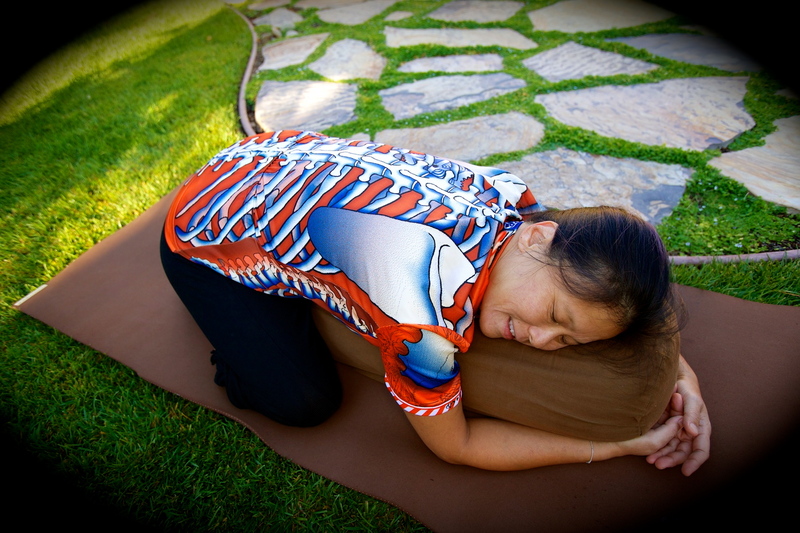 Using an opening of the front body and back body to balance Heaven and Earth to bring the Chi back into balance, we move in a sequence of Restorative poses. In Chinese anatomy, Earth is associated with the organs of Stomach and Spleen. They build and maintain the body. Stomach is where food is prepared for absorption, and Spleen helps absorb nutrients, feeding muscle and blood. When Earth elements are imbalanced, we can worry or have excessive mental agitation, lack of concentration and memory loss. We feel needy for food or attention, seeking sympathy or distraction. An imbalance in Earth can manifest in exhaustion, loss of appetite, poor digestion or loose stools and diarrhea, easy bruising and bleeding disorders.When Earth is off balance, internal cycles may suffer, and Earth thrives on routine, which settles the nervous system, stabilizes blood sugars and lowers blood pressure. Balancing work, socialising and self care is essential for healthy body, mind and spirit. What does your Earth need? How can you nourish your center? Practice drawing the image of the Spleen Meridian rising up, and the Stomach Meridian descending down, all meeting in the center. The focus will resonates with two of the most common qualities of the Earth Season – nourishment and stability. We finish discussion of the Earth element for this series in this class. As the Autumn Equinox moves in, we transition to Autumn Season, and it becomes the season of Metal-Lung-Large Intestine. The emotion and spirit that correspond to the Earth phase are thought, intellect, and sympathy. Imbalances emotionally can appear as over-thinking or excessive worrying, or an imbalanced ability for self-care. We can become either over-caring or overly un-sensitive toward the needs of others. Metal is the energy of Autumn. Like minerals, salts and gems of the earth, Metal is strength, structure and quality. Minerals provide richness that nourishes life, and the structural strength and conduits for communications to flow. Gold ingots were ancient currency in China, and release abundance, luck and good chi. They are for The Three Immortals Fuk Luk Sau, Tua Peh Kong, and Chai Shen Yeh. Metal is the energy of letting go all that is inessential. Like trees that shed leaves, so we can see the inner structure. As we move to Winter’s rest, we turn inward. Take rest and breathe deeply.